Swachh Bharath Mission: To accelerate the efforts to achieve universal sanitation coverage and to put focus on sanitation, the Prime Minister of India, Shri Narendra Modi, launched the Swachh Bharat Mission on 2nd October, 2014. The Mission Coordinator shall be Secretary, Ministry of Drinking Water and Sanitation (MDWS) with two Sub-Missions – the Swachh Bharat Mission (Gramin) and the Swachh Bharat Mission (Urban). The Mission aims to achieve a Swachh Bharat by 2019, as a fitting tribute to Mahatma Gandhi on his 150th birth anniversary. Swachhata Hi Seva: The Hon’ble Prime Minister has called upon the nation to begin a campaign, Swachhata Hi Seva, Cleanliness is Service, from 15th September 2017 to Gandhi Jayanti on 2nd October 2017. During his Mann Ki Baat address on August 27, 2017, he called upon people to create an environment of cleanliness in the entire country so that the coming 2nd October, the third anniversary of the Swachh Bharat Mission and Gandhi Jayanti, can be celebrated in a befitting manner. He urged all NGOs, schools, colleges, social, cultural and political leaders, corporates, government officials, Collectors and sarpanches, to accelerate Swachhta activities during the September 15 to October 2 period. The Ministry of Drinking Water and Sanitation shall be launching soon a section on MyGov.in wherein people, after constructing their toilets and undertaking other Swachhta-related activities, can register their name and the name of the beneficiary family, whom they helped. Pledge to Segregate: I pledge to segregate my (household, shop, establishment) waste in two dustbins, wet waste in Green and dry waste in Blue, as my contribution to the Swachh Bharat Mission. Lr. Rc. No: J/1397/2017 , Dated: 92- 09-2017. 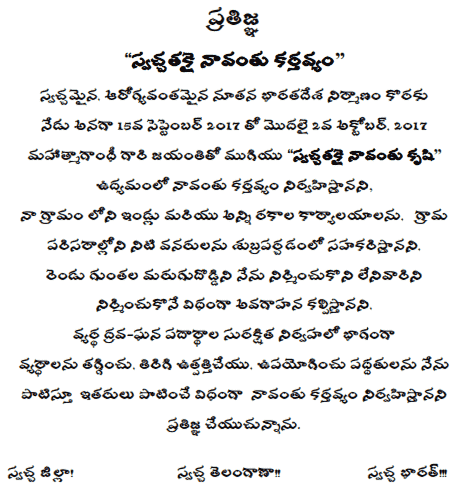 Sub:-DRDA - Warangal (Rural) - Swachhata Hi seva - Fortnight activities tobe taken up activities i.e., 15th September, 2017 to 2nd October, 2017 - Swachha Bharath Divas - Swachha Bharath Awards on 2nd October 4.00 pm Warangal rural Collectorate hall - instruction issued - Reg. Ref: PD SSBM(G), Hyderabad, Lr.no.117/HRD/SS/SSBM(G)/,2017, dated: 12.09.2017. Through the reference cited above, it has been informed the Gol launched fortnight program namely Swachha Hi Seva at all levels duly suggesting certain activities and Swachhatha Hi Seva Ratham schedule mandal wise and activities to be organizsed in this massive campaign. Further, as per the 15 days schedule on last day October, 2nd , 2017 a District level Swachha Bharath Divas - Swachha Bharath Awards for ODF declared Villages after June 2, 2017 is planned and it will be conducted on 2. October 4 pm at Warangal rural Collectorate conference hall. Therefore, all the MPDOs are here by requested to attend the programme on 2nd October, 2017 4 pm at Warangal rural Collectorate conference hall, along with ODF declared villages Sarpanchas, Panchayat Secretaries, filed assistant and all the Mandal team i.e., ED PRDS, RWS AEs, APOs, APMs. DRDA Warangal (Rural) - Swachhata Hi seva - Fortnight activities tobe taken up activities i.e., 15th September, 201 7 to 2nd October, 201 7 - instruction issued. The GoI launched fortnight program namely Swachha Hi Seva at all levels duly suggesting certain activities and Swachhatha Hi Seva Ratham schedule mandal wise and activities to be organizsed in this massive campaign. In continuation of the above instructions a detailed 15 days activities to be taken up date wise from 15.09.17 to 02.10.2017 in Mandals and villages is here with attaching for taking necessary action. Therefore, all the MPDOs are hereby requested to take up all the activities as per the schedule enclosed in co. ordination with the ICDS, SERP, Medical deparments, Schools and involving the Public representatives and villagers mostly the SHG Women in this massive campaign. Please take steps for daily wise activities to cover in media and the relevant pictures to be sent through ODF whatsup/MPDO whatsup group or mail to sbmwarangal.rural@gmail.com every day without fail. 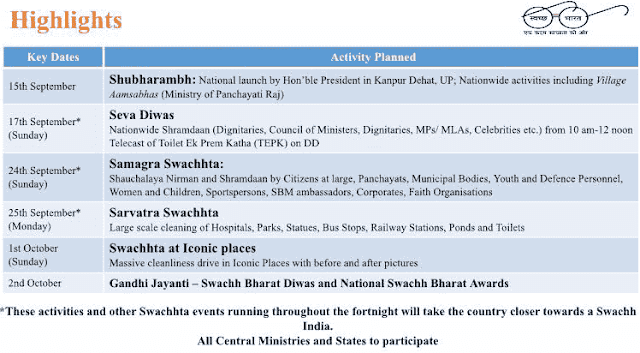 SSBM(G) - Swachhata Hi Seva - Fortnight activities to be taken up activities i.e. 15th September, 2017 to 2nd October, 2017 and Instructions. 1. Promotion of twin pit toilet technology and intense target based construction of twin pit toilet across the District/Mandals/GPs. 2. Lunch of special sanitation and cleaning related events across the Mandals on Seva Divas on 17th September, 2017. 3. Organizing Massive IEC activities including Swachhata Yatras, Swachhta Pledges etc. 4. Launch and continuous mobilization of Swachhata Raths in the Mandals. 5. Rallies with School Children, Women and grass root leaders. 6. Village Gram Sabhas to discuss local sanitation issues and attempt to find their solutions with the help of Mandal level officers. 8. Efficient and effective use of social audio visual and print media to create awareness and public participation. President launches nationwide Swachhata Hi Seva, Jan aandolan from Kanpur: The President Shri Ram Nath Kovind today launched the nationwide jan aandolan, Swachhta Hi Seva, from Iswarigunj, a village in Kanpur district of Uttar Pradesh. With this the whole country swings in to mass Shramdaan for toilet making and cleaning of public places for next two weeks. “#SwachhtaHiSeva” Campaign is an unprecedented campaign to highlight, once again, the jan aandolan that is the Swachh Bharat Mission. This follows an impassioned call by the Prime Minister, Shri Narendra Modi, ahead of the 3rd anniversary of Swachh Bharat Mission that falls on 2nd October, 2017. The objective of the campaign is to mobilise people between 15th September and 2nd October, reigniting the “jan aandolan” for sanitation. Union Ministers, MLAs, MPs, iconic celebrities of India, sports stars, inter-faith leaders, corporates, etc. have been appealed to join in this campaign towards swachhta. The President administered the nation-wide “Swachhta Hi Seva” pledge in Kanpur, which simultaneously initiated parallel action in all Gram Panchayats and cities of the country. He honoured village level champions from Uttar Pradesh who have contributed to making various villages, including Iswarigunj, open defecation free. The President also launched the Solid and Liquid Waste Management activities in the village which is the next major step in Swachhta after getting the villages Open Defecation Free. Every citizen who works for Swachhta is a rashtr-nirmata (nation builder). 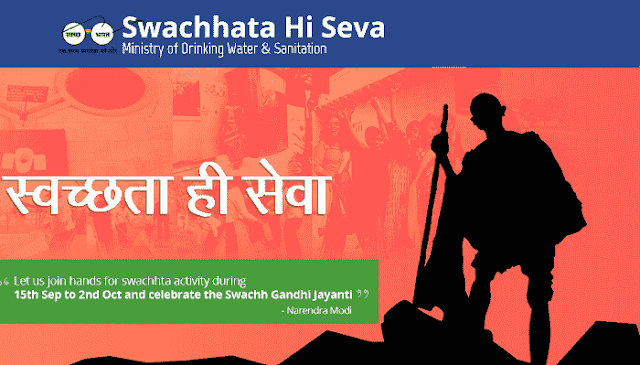 All citizens to join the Swachhta Hi Seva movement and become a rashtra-nirmata. All award winning Swachhta champions present and they were the real heroes of this jan aandolan. A World Bank study that says that lack of Sanitation costs the country 6% of GDP annually, the weakest sections of society are the ones most affected by this problem. Diseases transmitted by open defecation, concerns around dignity and safety of women, and economic loss to the family. According to President. He called upon people from all sectors - elected representatives, corporates, NGOs, women, children, senior citizens, Panchayati Raj institutions, media and the youth - to come forward and contribute to the Swachh Bharat movement with vigour and enthusiasm. The President's first public appearance after taking office was for the launch of the Swachhta Hi Seva campaign. The crucial role of public participation in making Swachh Bharat a reality. Swachhta was both, a right and responsibility, of each and every citizen of the country, and that this was fundamental to the realization of the Prime Minister, Shri Narendra Modi's vision of Swachh Bharat. This launch kicked off the nationwide campaign to mobilise people to do large scale shramdaan.